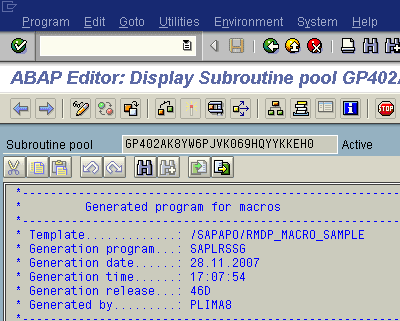 Go to SE18 (BADI Definition) --> open BADI BADI_SD_BILLING_ITEM in display mode. Go to 'Implementation' in Menu --> choose 'OVERVIEW' You can list all implemetations for your BADI.... Besides, for BADI�s you can find related BADI with debugging as described in this post. For me, ABAP code is not hard to read and every detail must be discovered by debugging ABAP code. So i have thought there must be a simpler way to define this customer-exit points by debugging especially with new functionality of New Debugger. 2/08/2015�� The user-exits and BAdIs focus on the same issue however they are implemented differently and all are set by SAP, in other words, SAP defines where this user-exits and BAdIs work in the system. How to see the source code (Method) of a BADI? For finding the BADI: put a break point in CL_EXITHANDLER class�s GET_INSTANCE Method and execute the Transaction code whenever it call a BADI debugger stops at that points. Advantage: It is for sure that you will get the respective BADI. When ABAP debugger is started go to top menu -> Breakpoints ->Breakpoint at -> Statement Enter command �CALL CUSTOMER-FUNCTION� and confirm Press F8 to continue the program � when CALL CUSTOMER-FUNCTION construct is reached in the code, the ABAP debugger is started and you can read the name of user exit. "hi all, I wish not to allow users to record the data entered in the me21n tx, and i'm coding inside the CACL_CHARACTER_INPUT badi, method SET_CHARACTER_INPUT.. how can i do for show one popup to the user and until him not write the correct data, don't let him to use the Save buttom? ?